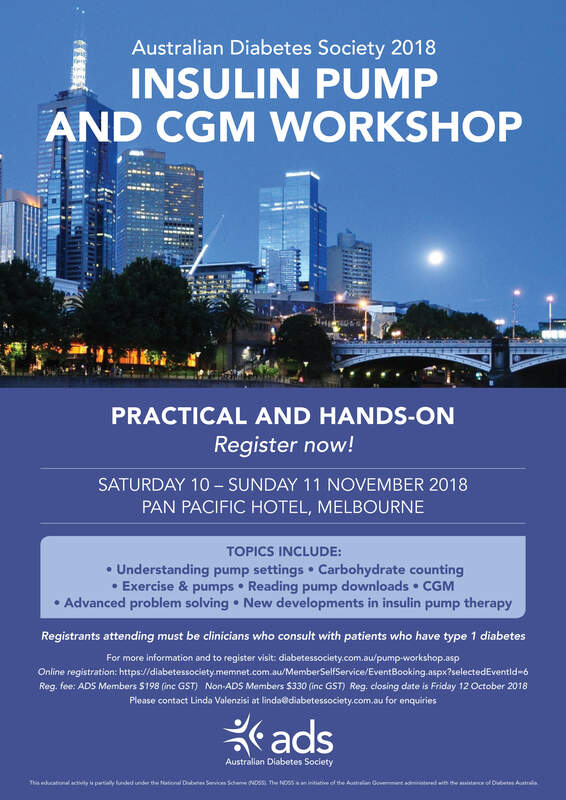 Following the success of the ADS Insulin Pump & CGM Workshop held in June this year, the Australian Diabetes Society is proud to host its second workshop in 2018 which will be held on Saturday 10 & Sunday 11 November 2018 in Melbourne at the Pan Pacific Hotel. The workshop is primarily for medical practitioners, especially endocrinologists and general physicians, who work clinically with people who have type 1 diabetes. The aim of the workshop is to provide structured practical training about insulin pumps and other technologies used in diabetes self-management. This workshop contains new content to reflect the recent developments in insulin pump therapy and CGM. Topics to be covered include new insulin pumps, continuous glucose monitoring, carbohydrate counting, exercise and pumps, advanced problem solving and closed loop technologies. Limited places are available for clinicians who have previously attended the workshop. Endocrinology Advanced Trainees and other diabetes health professionals may also register their interest and may be offered a place if space permits and will be notified following the registration closing date. Delegates travelling from interstate will need to organise their own travel arrangements (air travel and accommodation) to attend the workshop in Melbourne. This workshop is partially supported by funds provided to the Australian Diabetes Society under the National Diabetes Services Scheme (NDSS). The NDSS is an initiative of the Australian Government administered with the assistance of Diabetes Australia. We gratefully acknowledge the financial support for this educational activity. If you are not a member of the Australian Diabetes Society and wish to join; to apply for ADS Membership, please go to the following link https://diabetessociety.com.au/membership-apply-online.asp via the ADS website to submit your Membership Application Form. Cancellation fees do apply (see cancellation policy for details). Registration for the workshop closes on Friday 12 October 2018; but early registration is encouraged as limited places are available. Delegates travelling from interstate will need to organise their own travel arrangements. Please note that cancellation fees will apply. Please contact Linda Valenzisi at the ADS Secretariat via email at: linda@diabetessociety.com. au or phone on 02 9256 5462 if you have any enquiries regarding the workshop. The ADS is very grateful that this educational activity is partially supported by funds provided to the Australian Diabetes Society under the National Diabetes Services Scheme (NDSS). The NDSS is an initiative of the Australian Government administered with the assistance of Diabetes Australia. The Australian Diabetes Society is proud to host the 2018 ADS GP Diabetes Masterclasses in Melbourne, Sydney and Brisbane for General Practitioners involved in the care of people with diabetes. 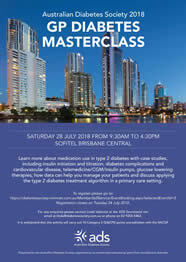 The third of the diabetes masterclasses will be held on Saturday 28 July 2018 in Brisbane at the Sofitel brisbane Central Hotel. The aim of this event is to provide education on medication use in type 2 diabetes with case studies, including insulin initiation and titration, diabetes complications and cardiovascular disease, telemedicine/CGM/insulin pumps, glucose lowering therapies, how data can help you manage your patients, and discuss applying the type 2 diabetes treatment algorithm in a primary care setting. Registration is free to attend and is only open to General Practitioners. It is anticipated that this activity will carry out 10 Category 2 QI&CPD points accreditation with the RACGP. Registration for the Masterclass closes at 5.00pm on Tuesday 24 July 2018; but early registration is encouraged as limited places are available. Delegates travelling from interstate will need to organise their own travel arrangements. Please contact Linda Valenzisi at the ADS Secretariat via email at: linda@diabetessociety.com.au or phone on 02 9256 5462 if you have any enquiries regarding the Masterclass. This workshop is designed to apply the updated Type 2 Diabetes Treatment Algorithm in primary care by using appropriate case studies. This will include insulin initiation and titration as well as combination use of newer therapies for better outcomes. This education forms an accredited activity under the RACGP QI&CPD program. The Australian Diabetes Society (ADS) gratefully acknowledge the financial support provided by the National Diabetes Services Scheme (NDSS) for this educational activity. The National Diabetes Services Scheme (NDSS) is an initiative of the Australian Government administered with the assistance of Diabetes Australia. Car Parking: Car parking is free of charge after 5.00pm on weekdays in all university car parks. It is anticipated that the ADS GP Case Study Workshop will carry out Category 2 QI&CPD points accreditation with the RACGP. Registration is free to attend (dinner included) and is only open to General Practitioners. Registration for the workshop closes on Monday 14 August 2017 but early registration is encouraged as limited places are available. Please contact Linda Valenzisi at the ADS Secretariat via email at: linda@diabetessociety.com.au if you have any enquiries regarding the workshop. The Australian Diabetes Society as undertaken a commitment to provide ongoing education in diabetes management for general practitioners to enable them to provide better evidence based care for people with diabetes. The ADS will be conducting a series of day seminars and workshops for general practitioners. The focus of these sessions will be on providing GPs with information and skills to facilitate their day to day care of people with diabetes. The program will draw upon the key issues identified through our consultation with general practitioners. The seminars will be conducted by prominent local diabetologists, with an additional goal being to build relationships between GPs and their local diabetes services. The 2015 ADS GP Training Day will be advised in due course. There will be interactive workshops to improve your diabetes management skills. It is anticipated that the ADS GP Training Days will carry out 40 Category 1 QI&CPD points accreditation with the RACGP. Registered GPs can access presentations from the GP Training Days online.